The American Society of Testing and Materials (ASTM) test B117 is one of the most widely adopted standards for salt spray testing. Its use is internationally widespread and its provisions have been frequently re-written into the national standards of other countries, and also appear in other industry specific corrosion test standards. ASTM B117 is an excellent reference document for the salt spray practitioner, with many helpful hints and tips contained in its useful appendixes. It is also regularly updated, by an active and broad based ASTM sub-committee, so it is a standard that is continuously evolving. The suffix to the main standard number indicates the year of publication. For example, ASTM B117 – 11 indicates a 2011 publication date. Practitioners applying the ASTM B117 test standard are responsible for checking they are using the most appropriate version for their application. 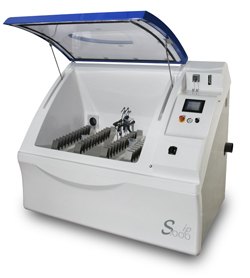 Test specimens are placed in an enclosed chamber and exposed to a continuous indirect spray of salt water solution (also referred to as fog or mist) which falls-out on to the specimens at a rate of 1.0 to 2.0 ml/80cm²/hour, in a chamber temperature of +35C. The pH of the salt solution fall-out should be maintained at a neutral pH ((pH 6.5 to 7.2 – this is also commonly referred to as NSS, which stands for Neutral Salt Spray). 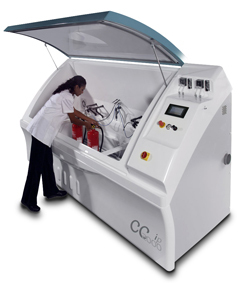 The chamber climate is maintained under constant steady state conditions. 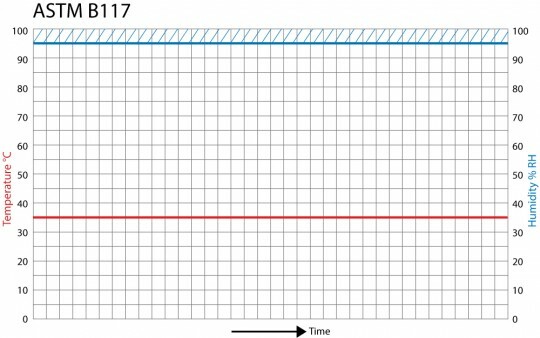 The test duration is variable. Salt spray testing is performed by placing samples in a test chamber designed in accordance with ASTM B117 and operated in accordance with the specified conditions in ASTM B117. The test solution to be sprayed is prepared by dissolving pure sodium chloride into pure water, in a ratio of 5% sodium chloride to 95% water, by weight. The purity for each should be as specified in ASTM B117. 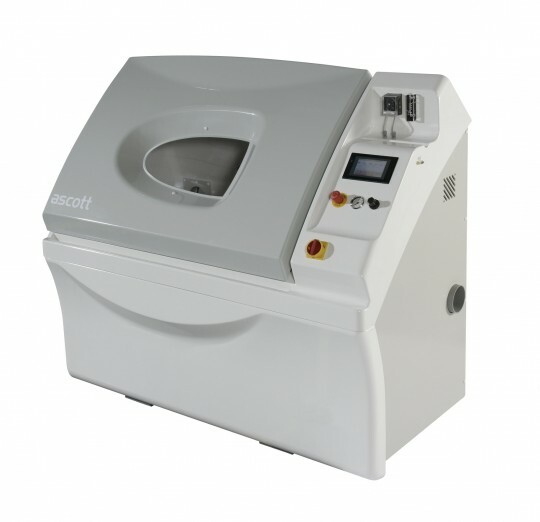 At the time the samples are placed into the test chamber, it should be pre-conditioned to the operating temperature of 35˚C and producing fall-out at the specified rate. The salt fog fall-out rate is verified by using a minimum of two 80cm2 funnels per salt spray atomiser, each inserted into a measuring cylinder graduated in ml. These collectors are located inside the chamber, nominally at the same height as the test samples, one located close to the atomiser and one located away from the atomiser, in accordance with the positions specified in ASTM B117, but also taking into account the chamber manufacturers defined work-space. This test can be used to test the relative resistance to corrosion of coated and uncoated metallic specimens, when exposed to a salt spray climate at an elevated temperature. Prior to the appearance of white rust the approximate test duration should be c.350hrs and for red rust to appear the approximate test duration should be c.1000hrs. 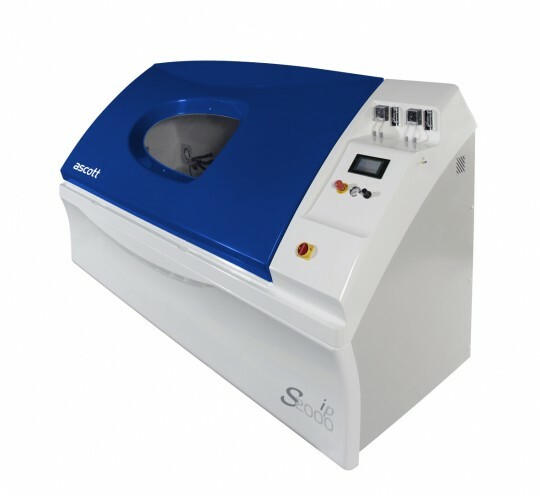 The principle application of the salt spray test is therefore to enable relatively quick comparisons to be made between actual and expected corrosion resistance in terms of the time taken for oxides to appear on the samples under test. This is compared to expectations, to determine whether the test is passed or failed. For this reason the salt spray test is most often deployed in a quality audit role, where, for example, it can be used to check the effectiveness of a production process, such as the surface coating of a metallic part. 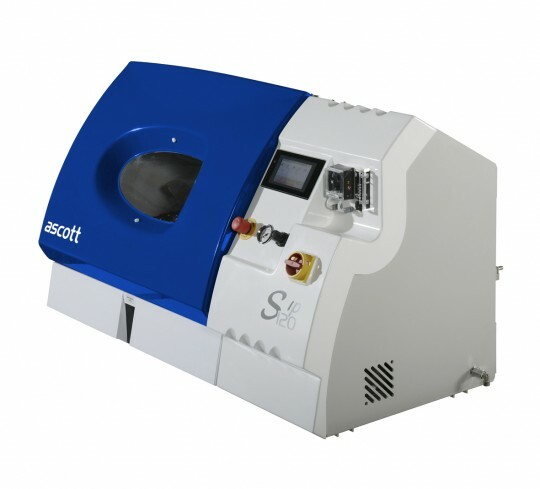 The salt spray test has very little application in predicting how materials or surface coatings will resist corrosion in the real-world, because it does not create or accelerate real-world corrosive conditions. 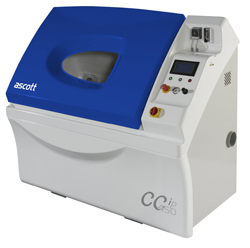 Cyclic corrosion testing (CCT) is much more suited to this application. Also: the terms salt spray, salt mist & salt fog are all in wide spread use within corrosion test standards. In this context they can be considered to be equivalent and interchangeable terms.